This weekend has much in store for college hoops heads. 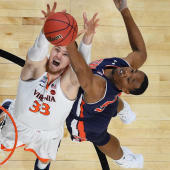 Between regular season conference races coming to a close and postseason conference tournaments getting underway, there will be plenty enough basketball to acclimate and pace yourself for the most splendid time of the season: March Madness. Akron at Kent State, 6:30 p.m.
Women: A-10 tournament semifinal, 11 a.m.
Women: A-10 Tournament semifinal, 1:30 p.m.
Missouri Valley Tournament semifinal: Loyola-Chicago vs. Bradley, 3:30 p.m.
Missouri Valley Tournament semifinal, 6 p.m.
Wichita St at Tulane, 8:30 p.m.
San Diego St at Nevada, 10:30 p.m.
Patriot League Tournament semifinal, 12 p.m.
Patriot League Tournament semifinal, 2 p.m.